Climate change poses a significant threat to Africa’s continued economic growth and the livelihoods of vulnerable populations. No continent will be struck as severely by the impacts of climate change as Africa, which is particularly vulnerable due to its limited adaptive capacity and widespread poverty. To address these issues, this week, diverse stakeholders from the public and private sectors are gathering in Accra for Africa Climate Week 2019. The event focuses on how climate engagement can be strengthened in key sectors for Africa, including energy, agriculture, and human settlements; showcases the role of future carbon markets; and seeks to facilitate implementation of countries’ nationally pledged financial contributions under the Paris Agreement on climate change. Chapter 4 of Foresight Africa: Top Priorities for the Continent in 2019, released earlier this year by the Africa Growth Initiative at Brookings, discusses the exacerbating effect that climate change will have on the challenges faced by fragile and least-developed countries. As Figure 1 shows, competition over limited water resources will be a major concern for development as climate change and population growth begin to affect freshwater availability and demand. By 2050, under moderate climate change projections, Africa is likely to have some of the world’s most contentious disputes over water. 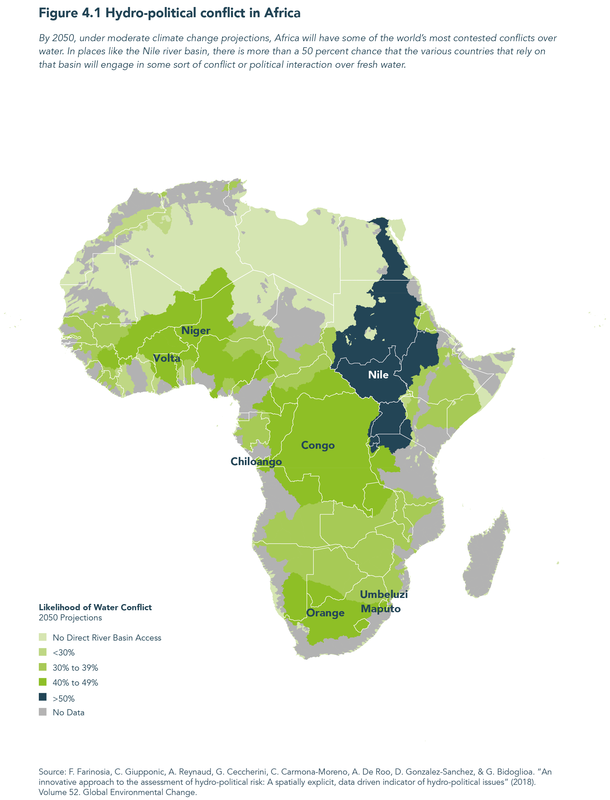 In areas such as the Nile River Basin, there is more than a 50 percent chance that the 11 countries and 300 million people that rely on that basin will engage in a conflict or political interaction over water. In some cases, these interactions have already begun; Ethiopia’s ongoing construction of the Grand Renaissance Dam on the Nile, for example, has placed the country at odds with Egypt and Sudan. As Ahmadou Aly Mbaye discusses in his Viewpoint, climate change acts as a conflict multiplier by amplifying existing environmental stresses and creating new ones, thus worsening resource scarcities and water and food insecurity. Governance and institutional weaknesses amplify these effects. As climate change puts more pressure on already fragile areas, it will become increasingly important to find ways to nurture cooperation and peaceful resolutions to disputes over resources. Cooperation over water should be actively pursued in the areas where water issues are most likely to arise in order to avoid possible tensions, especially under changing environmental conditions. Continued international cooperation through events such as Africa Climate Week will also be vital to reduce the severity of climate change and thus the likelihood of conflicts.